Casting for CW’s The Flash continues to plumb the depths of Firestorm characters! On next week’s episode of The Flash, we’ll see Firestorm foe Eddie Slick (a.k.a. Sand Demon) portrayed by Kett Turton! Talk about obscure! Eddie Slick first appeared back in Fury of Firestorm #51 & #52 (1986). When he was first introduced, Eddie was a corrupt boxing manager. He had no super powers, but was a surprising look-a-like for Professor Martin Stein. When Eddie reappeared in Firestorm the Nuclear Man #74 & #75 (1988), he’d been buried alive in the desert by his gangster “friends”. Through a series of unique events, Eddie survived and was transformed into a creature entirely composed of sand, able to control other sand at will. He called himself “Sand Demon” and went on a rampage across Las Vegas. From next week’s preview of The Flash, it appears the TV version of Eddie Slick has similar powers. From a creator rights perspective, this character raises an interesting question. Writer Gerry Conway and artist Joe Brozowski created the character of Eddie Slick. However, Eddie didn’t have any super powers in those appearances. 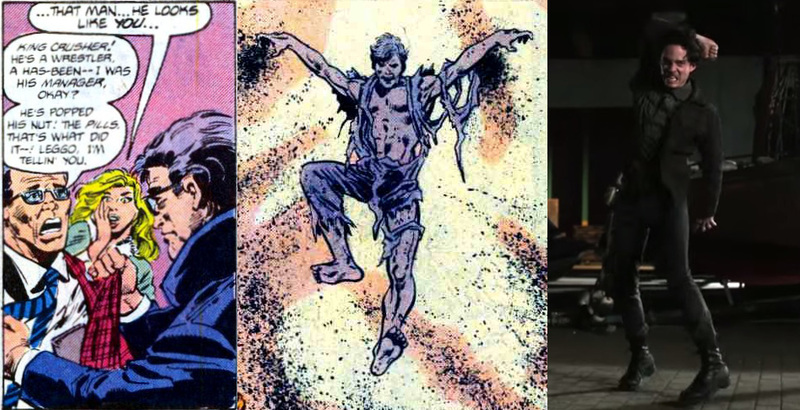 Writer John Ostrander and artist Joe Brozowski introduced Eddie Slick’s powers and the Sand Demon persona. So which writer gets financially compensated for Kett Turton’s portrayal on The Flash next week? Is the Sand Demon derivative of Eddie Slick, or the same character? Is this another creator rights situation similar to what happened with Caitlin Snow? I can’t help but wonder. Not much is known about Eddie Slick’s early life, apart from the fact that he had always been good in making the worst choices possible. He lived in New York City, and he was a small-time crook, a gangster-wannabe who always tried to make money the fastest way possible. He joined a group of professional criminals, some true mobsters who had quite a taste for gambling…especially when they won. In order to become good friends with them, Slick reinvented himself as a boxing manager, obviously doing his best to fix the competition, warning his pals which fighter they had to place their bet on. His most succesful athlete was a beast of a man stage-named King Crusher, who was doing good…but not good enough. Slick drugged all his athletes as a rule, but with Crusher he decided to do something more, and when he managed to put his hands on some experimental mutagenic steroids, he treated Crusher with them. As a result, King Crusher surely became bigger and stronger, and he kept winning a match after the other…but the process wasn’t stopping, and he became strong to superhuman levels; the steroids also affected his psyche, and the wrestler went mad. In a vengeful rampage, King Crusher targeted Eddie, and the manager couldn’t do anything but run from him. Luckily enough, in NYC’s streets King Crusher saw Professor Martin Stein, who was dating Emily Rice. Coincidentally, Stein looked exactly the same as Slick, and the wrestler targeted him instead. Stein had the time to look for his young friend Ronnie Raymond and to merge with him to form the superhero Firestorm, defeating King Crusher and saving Eddie Slick in the process…but the whole illegal steroids traffic, the gambling circuit and all Slick’s affairs were exposed, thus ending the crook’s criminal career. Eddie Slick managed to avoid prison, but that wasn’t a stroke of luck at all: his powerful friends from the mob had lost a fortune with the King Crusher affair, and they wanted to exact justice their own way. Slick was deemed responsible for the entire situation, and the gangsters decided to make an example of him: they brought him to their headquarters in Las Vegas, and they executed him by buring him alive in the Nevada Desert. The sand of the desert, however, was irradiated, and the close encounter with Firestorm had already modified Slick’s organism: instead of dying as he was supposed to, Slick was transformed into a creature entirely composed of sand, able to control other sand at will. Weeks spent underground had also made Slick insane, and he emerged from the desert pretty much deranged: naming himself Sand Demon, Slick returned to Las Vegas and started hunting down his former friends and employers, killing them one after the other. These murders attracted the attention of the new Firestorm (formed by Ronnie Raymond and Mikhail Arkadin), who was looking for a still MIA Martin Stein. From the news, Ronnie believed that the Sand Demon was actually Stein, and traveled to Las Vegas to try and make him “come back to his senses”. In the middle of a desert, with all that sand at disposal, Slick proved to be an extremely dangerous opponent even for Firestorm, especially considering that the latter was restraining himself believing he was facing his friend Martin Stein. When Ronnie realized the Sand Demon wasn’t Stein at all, and that he was far too powerful and too crazy to be controlled, he stopped holding back, and he used his powers to overheat Slick, turning him into glass. The Sand Demon’s body fell to the floor and shattered, thus ending the short-lived superhuman existence of Eddie Slick. Eddie Slick is, simply put, a complete failure. Greedy, vulgar, sneaky, Slick makes the one and simple mistake of believing himself to be extremely smart, while he’s actually quite a dumb man. As the Sand Demon, he’s a remarkably powerful being, entirely made of sand (thus invulnerable to most arm) and capable of manipulating surrounding sand as well: in the Nevada Desert, he has an entire state to control, thus creating sandstorms, tornadoes and even gigantic quicksands. Just as powerful as he is crazy, Sand Demon is an extremely dangerous man, once stupid and mediocre, now stupid and lethal. With all these Firestorm characters on The Flash, I can’t help wondering if at some point we’ll see Hyena, Typhoon, or Black Bison. While I ask that, I can also argue against them. Hyena might be too redundant on The Flash as an animal foe after introducing Gorilla Grodd. Typhoon might be too redundant on The Flash after introducing Weather Wizard. That leaves Black Bison, which would be really cool, but walks that dangerous line of reinforcing stereotypes. So bottom line… watch for Zuggernaut and Bazooka Joan in season three!! C’mon Shag! What about The Flash Season Two Premier?!? By this point, I’m sure some of you are wondering why I haven’t mentioned the events of The Flash season premier. I’m sure some folks haven’t had a chance to watch the episode yet, and I don’t want to be the guy to spoil it for them. We’ll talk about that later. Yes, we definitely will. Support Firestorm (and Sand Demon)! Fan the flame! Posted in: Flash TV Series, Gerry Conway, Joe Brozowski, John Ostrander, Rogues Gallery. ← Watch New Flash Tonight! First Look at New Firestorm! Moonbow and Slipknot should both make the leap. Mindboggler would work well against Flash, actually. Running into a wall at high speed that you don’t there should really be a problem, after all. Argh… “don’t think is there”. Knew what I meant to write. I think they could rehab Black Bison to not avoid the stereotypes but make the character someone who could be a positive representation of Native Indian culture. Granted I don’t know much about the character but they reworked him to where he’s avenging some wrong done to his people and makes him more of a tragic character than just an evil one. Black Bison? Could be worse; could be Silver Deer. I’ve only heard the name. Don’t know anything about that one.